As this is being written, a Sunni-dominated army under the aegis of the Islamic State of Iraq and Syria (ISIS) is marching through much of northern Iraq, heading to the nation’s capital, Baghdad. Pressure is mounting on the hapless Obama administration, which seems to have been caught a little by surprise as Iraqi military personnel jettisoned uniforms and weapons to flee the ISIS advance, to do something. Some people are calling for air strikes, though intelligence that would make the airstrikes useful against the amoebic ISIS structure appears to be in short supply. Others are suggesting that the U.S. recruit tactical and military support from Shiite-dominated Iran to bolster the Iraqi regime, notwithstanding the historical oddity of having the U.S., which has long been talking about bombing Iran to stop its nuclear program, join up with the mullahs to resist the marauding Sunnis. Still others are concerned that the U.S. position—sort-of in support of the Sunnis in Syria against the Assad regime backed by the Shiite Hezbollah, nominally allied to Sunni nations along the Persian Gulf but supporting Nouri al-Maliki’s Shiite government in Iraq—is hopelessly muddled and likely to accomplish the creation of a new radical state in the region, undoing the Sykes-Picot borders from World War I, which could become the new Al Qaeda locus in the region for terrorist attacks on the West. What has many Americans scared is that this chaotic scenario will lead the U.S. into some new form of military intervention in the region, despite having twice elected Barack Obama as president in part due to his commitment to withdraw the U.S. military from Iraq and Afghanistan. Even the Nobel Peace Prize–winning president has been responsible for a surge in Afghanistan, an air war in Libya to create yet another just-about-failed state, and, by refusing to arm moderate forces in Syria, the weakening of the opposition to Assad and the strengthening of jihadist elements among the rebels. It may have been the unthinking commentary of a rusty political candidate, but Hillary Clinton last week hinted that she would be open to keeping a residual U.S. military presence in Afghanistan, no doubt because, as she noted, the Afghanis are watching what is happening in Iraq. At the same time, she has cautioned against providing military support to the al-Maliki government in Iraq. Will the U.S. nonprofit sector countenance a return to military engagement in the Middle East, even if the military engagement is from the air rather than boots on the ground? With an election coming in 2014, are antiwar activists going to take positions that might embarrass the lame-duck Obama or the likely Democratic standard-bearer, Clinton? She adds that the Obama administration’s proclivity to wage war without war, with actions such as drone strikes (16 in Pakistan on the day she wrote her commentary), makes the withdrawal of troops something less than a stoppage of warfare. 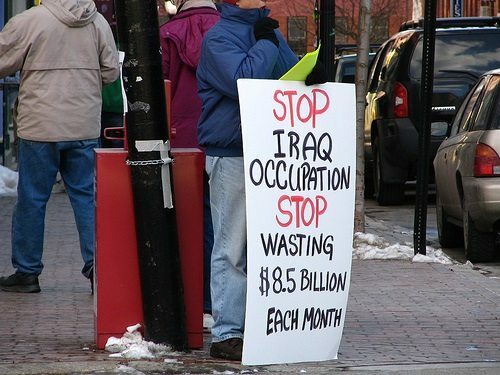 Her point matches that of right-wing critics who, while admitting that the Bush administration bears the initial and major responsibility for having created the Iraq War mess, note that the antiwar movement, except for some libertarian interests, has been largely silent in the wake of the Obama administration’s active bombing and drone campaigns in several countries. What does an antiwar movement actually accomplish? Law professor Marjorie Cohn writes that Daniel Ellsberg, perhaps the nation’s most famous critic of the American intervention in Vietnam, does not believe “that the antiwar movement shortened the war, but he says the movement put a lid on the war.” That means that perhaps the antiwar movement helped deter President Johnson from accepting some of the more extreme options that his military advisors were suggesting to reverse the course of the war. A revival of an antiwar movement now might help rein in the inclinations of Hillary Clinton or others to pursue strategies that will take the U.S. back into a self-defeating military engagement in the Middle East.